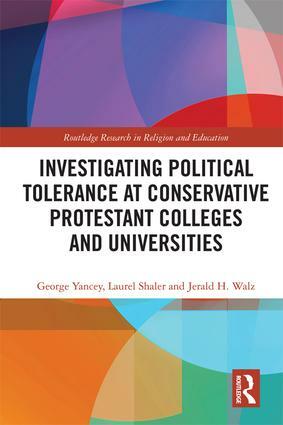 This book aims to investigate the level of political tolerance at conservative Protestant colleges and universities. Through innovative and methodologically sophisticated techniques, the authors test the political openness of these institutions as a proxy for their willingness to accept opinions that fall outside of those held by their religious community. The purpose of this study is to determine if there is an insular environment at conservative Protestant institutions beyond religious obligations, or if these institutions are only restrictive as it concerns those theological commitments. Drawing from five distinct sets of data, the authors demonstrate that conservative Protestant institutions of higher education exhibit more political diversity and political tolerance than other institutions of higher education, including elite ‘Research 1’ institutions.